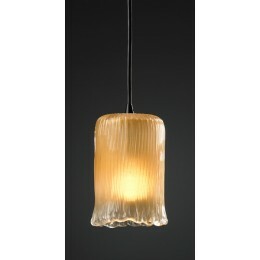 The Justice Design GLA-8815-16-CLRT-DBRZ-BKCD Veneto Luce Ceiling Mount collection Pendant Lighting in Dark Bronze uses Incandescent light output and brings Contemporary style. 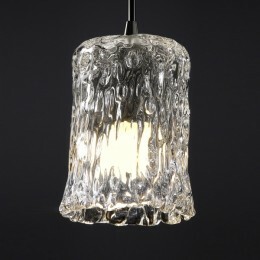 This item is 6.25"H x 4.5"W. The total wattage is 40 and the voltage is 120 volts. The Justice Design GLA-8815-16-CLRT-DBRZ-BKCD requires 1 bulb (not included). 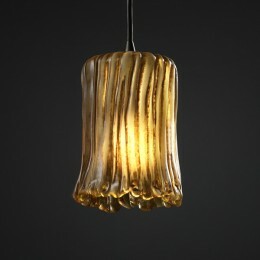 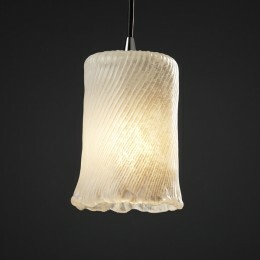 Additional Information: Shade-Hand-Crafted Clear Textured Venetian Glass with Ripplied Rim.